An eye-catching wooden house, or rather, a mansion, stands in the very center of Krasnoyarsk. It was owned by Frida Zimmerman, a merchant woman. Its window frames (it is often a case with wooden houses made by architects) absolutely do not resemble any other ones in Krasnoyarsk. The house itself is quite different: it was re-built radically (in 1911 or in 1913) in a strange mixture of Gothiс and art nouveau styles, and now is a sure star of Krasnoyarsk wooden architecture. 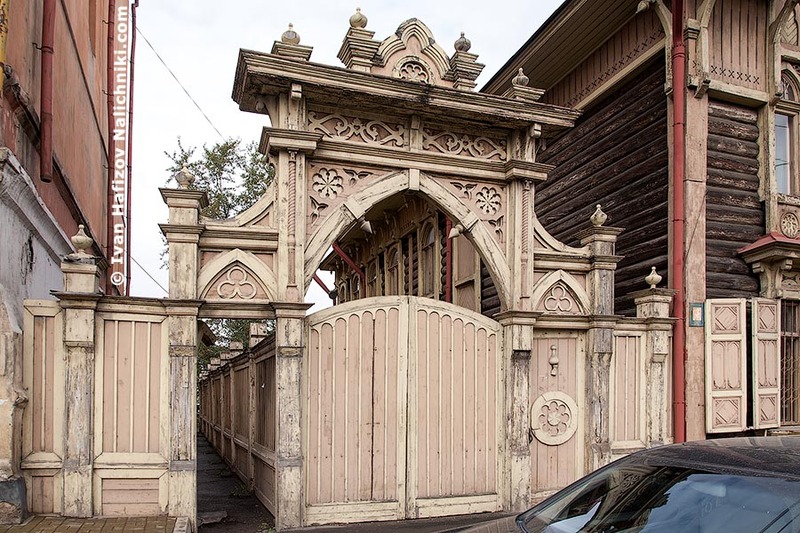 Many photos of this house are available on the Internet, and even Wikipedia ,writes about it, so today I offer just a fragment of the mansion – gate of the house 66 in Lenin Street of Krasnoyarsk, former house of Frida Zimmerman, and now a literature museum.